Venezuela's best-loved folk singer Simon Diaz is finally being recognized by the Latin Grammy organizers for his contribution to Latin music. The composer of "Caballo Viejo" - a massive international hit for the Gipsy Kings as "Bamboleo" - will pick up a Lifetime Achievement Award at a special ceremony on 12 November, the day before the Ninth Latin Grammy show at the Hobby Centre in Houston, Texas. The award represents a major milestone in the long and illustrious career of Diaz, who celebrated his 80th birthday on 8 August this year. 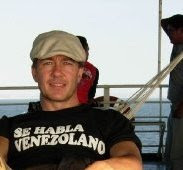 The announcement on 30 September came after a campaign to "bring Simon Diaz to the 2009 Grammy" by a group called "Venezuelans in Hollywood", supported by actors such as "The Mummy" actress Patricia Velasquez, and musicians such as Oscar D'Leon, Los Amigos Invisibles, Ricardo Montaner, Jose Luis Rodriguez ("El Puma") and the Gypsy Kings. A Facebook group supporting the campaign currently has 51,000 members. Also collecting awards will be New York salsa legend Larry Harlow, from the Fania Allstars, and the Cuban composer and guitarist Juanito Marquez. Click here for a video of "Caballo Viejo"
oh my i just love my dear venezuela! i love it! Thanks for making me aware of the backstory on this, I didn't know about Bamboleo or that there had been a campaign to get him recognized. Bravo, grassroots efforts! GRACIAS POR QUERER A NUESTRO PAIS, ES UN PEDACITO DE ESTE HERMOSO PLANETA QUE LO TIENE TODO. BESOS.